UPDATED Mar. 5, 2019. Medicare Supplement Plan N, also known as Medigap Plan N, was introduced in June of 2010. To lower monthly premium costs, Plan N uses copays which include: up to $20 for a doctor’s visit, and $50 for emergency visits. The result is an affordable and top-rated plan with a monthly premium 30%-35% lower than the all-covering the Medigap Plan F and 12%-15% lower than Medigap Plan G.
Get familiar with Medicare Supplement – Watch Liberty Medicare Video. Like all Medigap plans, the Medicare Supplement Plan N is standardized. Its benefits are the same for all insurance companies offering the plan. Premiums, however, may be very different from one company to the next. Most Medicare Supplement insurance companies offer Medicare Supplement Plan N. Here we’ll discuss the main reasons to choose Medigap Plan N in 2019. What does Plan N not include? Medicare Part A coinsurance and hospital costs up to an extra 365 days after Medicare benefits end. Medicare Part B coinsurance (usually about 20% of outpatient expenses) or copayment (hospital outpatient services). Copayments are required: up to $20 for a doctor’s office visit and $50 for an emergency visit. Blood Coverage: The first 3 pints of blood per year. Medicare Part A Hospice Care coinsurance/copayment. Skilled Nursing: Medicare Part A coinsurance (20% that Medicare does not disburse for nursing facilities). Part A Deductible: $1,364 per benefit period in 2019. Foreign Travel Emergency – Emergency Medicare coverage outside of the US. Medicare Part B Excess Charges (defined as the amount the doctor may charge above the Medicare-approved amount. It cannot be more than15% of what Medicare pays). How is Medigap Plan N different from Medigap Plans G and F? 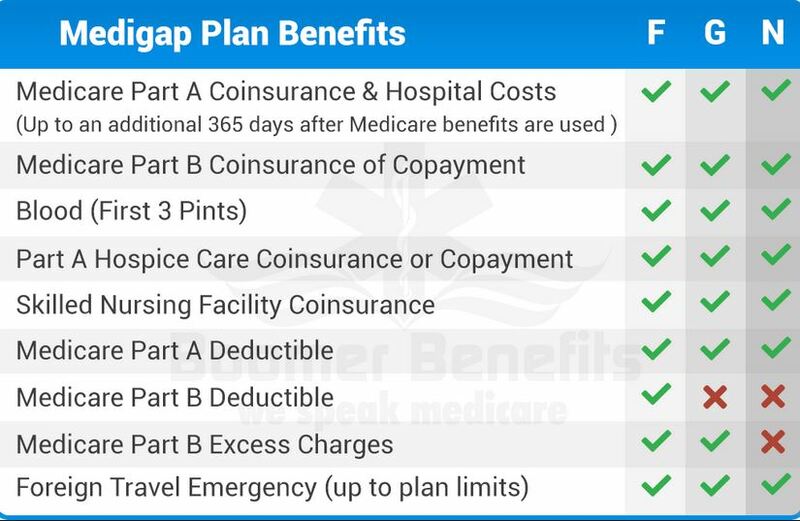 Medigap Plan G is the same as the Medigap Plan F, but it does not cover Medicare Part B deductible ($185 is 2019). Does any doctor accept the Medigap Plan N? YES, as long as your doctor accepts Medicare. Are Plan N benefits depend on Medigap vendor? The benefits of Medigap plans are NOT dependent on vendors. All Medicare Supplement plans are standardized, i.e., any plan bought from one company is identical to the same plan purchased from any other company. Plan N premium, however, may vary from vendor to vendor. Does Medicare Supplement Plan G cover prescription drug plan? NO, it does not. You need to buy Medicare Part D (Prescription Drug Plan) separately. What are expected Medicare Supplement Changes in 2020? Medigap plans that include coverage of Part B deductible (Plan F, Plan C, and Plan F High-Deductible) will no longer be available starting year 2020. However, the current Medigap policyholders and new enrollees up to 2020 would be protected. What is Medigap Plan N coverage of Foreign Emergency? Medicare Supplement Plan N pay 80% of the billed charges for medically necessary emergency care outside the U.S. after you meet a $250 deductible per year. This plan is excellent for anyone in good health which only visits a doctor occasionally and doesn’t want to be over insured. For those who are now enrolled in Medicare Advantage and would like to return to Original Medicare it is important to note that because Medigap plans don’t have network restrictions and much lower out-of-pocket expenses, Medigap Plan N provides a cost-effective alternative to Medicare Advantage. It provides a smoother transition to new Medicare members familiar with the copay concept. Ultimately, for people who are healthy or on a fixed income, Medicare Supplement Plan N premium savings may offset benefits presented in more expensive plans, such as Medigap Plan F or Medigap Plan G. Good health is essential: savings in premium payments using Medigap Plan N will not compensate you for the money spent on copayments if you see a doctor on a frequent basis (let’s say twice per month). Starting in 2020 Medicare Supplement plans will no longer be allowed to offer coverage of the Medicare Part B deductible. 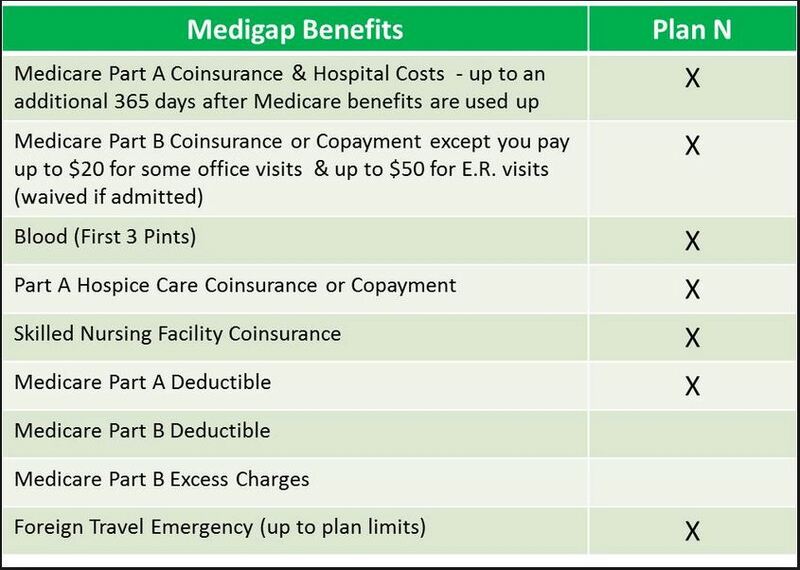 Medigap Plan N does NOT provide coverage of the Medicare Part B deductible. Therefore, it’ll be available to new enrollees, and its premium will not change dramatically. It may be a challenging task to select the right plan for you, considering there are ten plans to choose from. Not all Medigap providers carry all of these plans. The difference in premiums for the same type of plan among different vendors will vary significantly. Use the Liberty Medicare expertise to your advantage. Find the Medicare Supplement plan that is best for your financial and health needs. All our services are absolutely free to you. Learn more about all the benefits of working with Liberty Medicare.